Ordering beads on the internet can be tricky. At least for me it is. 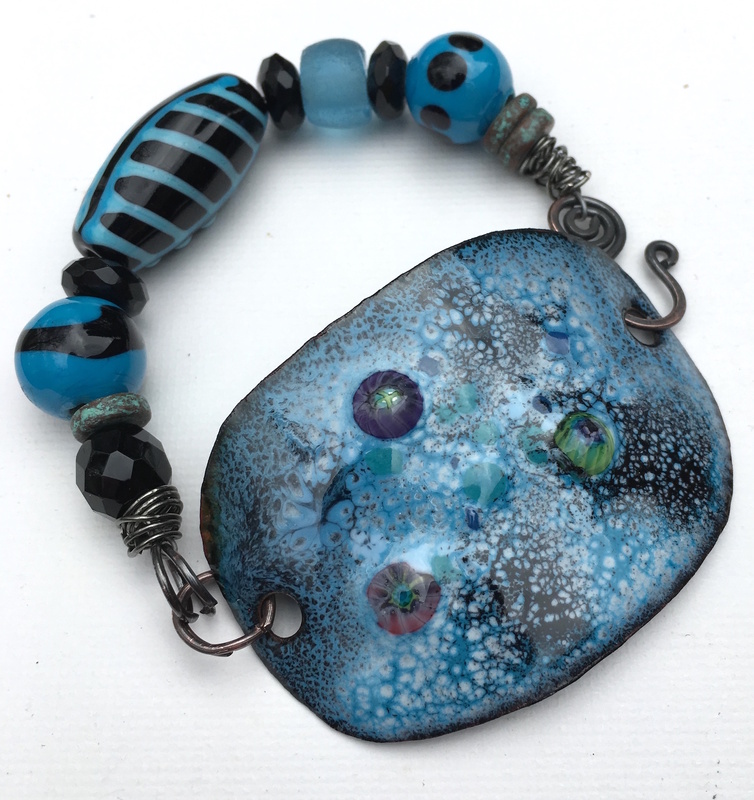 I have difficulty visualizing mm sizes when I order beads and I’ve ordered beads that when I got them they were so tiny I was floored (no misrepresentation was involved in the seller – it was me and my inability to visual the size). I’ve also ordered beads that were much larger than I anticipated. Well recently Cynthia Machata of Antiquity Travelers had one of those moments. Cynthia ordered some grey pearls for a project and when she received them, they were ahem lets just say a lot larger than she anticipated. Cynthia used the pearls in her project and because of the size, was left with an over abundance of these beautiful pearls. 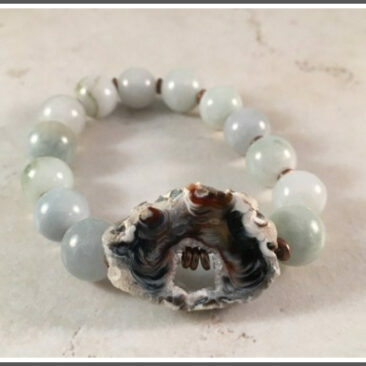 Cynthia decided to have a blog hop and send out six of these pearls to six people willing to play around with these beauties for a blog hop, count me in. 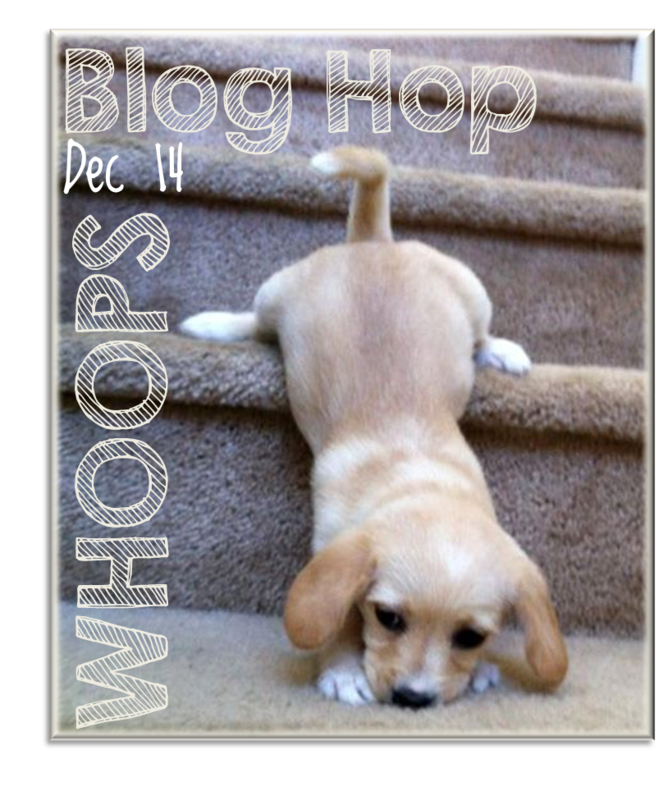 Now I have no business signing up for any blog hop at this time of the year and I’ve been scrambling as I’m sure everyone else has been with their busy schedules. I came up with an idea awhile back for these gorgeous pearls but as I’m prone to do, I waited until almost the last minute to execute. I actually thought the hop was last weekend – the same weekend as my jewelry open house. Scrambling around, I put together the focal for my piece. Awhile back I was rooting around in my stash and I found some sterling silver wire that I forgot I had. I also discovered some sterling silver squiggles that I bought some years back that I also forgot about. I made a structure for my piece with the heavy gauge sterling wire, wire wrapped the pearls and added them to the structure. My first attempt wasn’t working out as I had planned – the pearls and squiggles were too close together and didn’t stay put on my structure. Also stashed away in my stash of beads, tools and long forgotten gems was a coiling gizmo. I used some of the thin gauge wire that I discovered in my stash and made some short coils to use as spacers between the pearls and squiggles. I am pretty pleased with the finished focal however I’m still unsure as to how I want to finish off the necklace. Having an extra week for the reveal allowed me to order some soft grey seam binding that I thought I would use but I’m not sure that’s what I want to do. I’m also toying with using some black leather for the back portion but of course I don’t have black leather to use so my project in incomplete. Big thanks to Cynthia for allowing me to participate and please check out these other participants to see what they came up with for the hop. 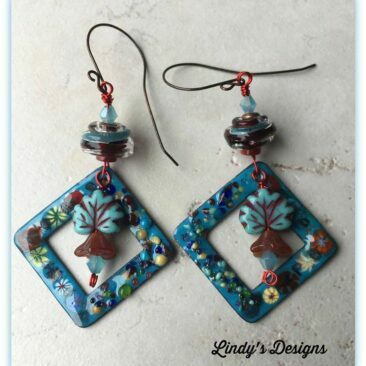 I love the focal piece and it would look gorgeous with whatever you decide to use as the neck strap. The coil spacers were a great idea to keep everything in it’s place. Oh, what a fun statement piece you made with the pearls. I love how everything kinda fell together (with the exception of the finishing) I can see the seam binding in the picture and it is lovely, but I do bet the stark of the black leather would finish it off perfectly. This piece is fun and quirky, but still so professional and elegant. Wonderful!! 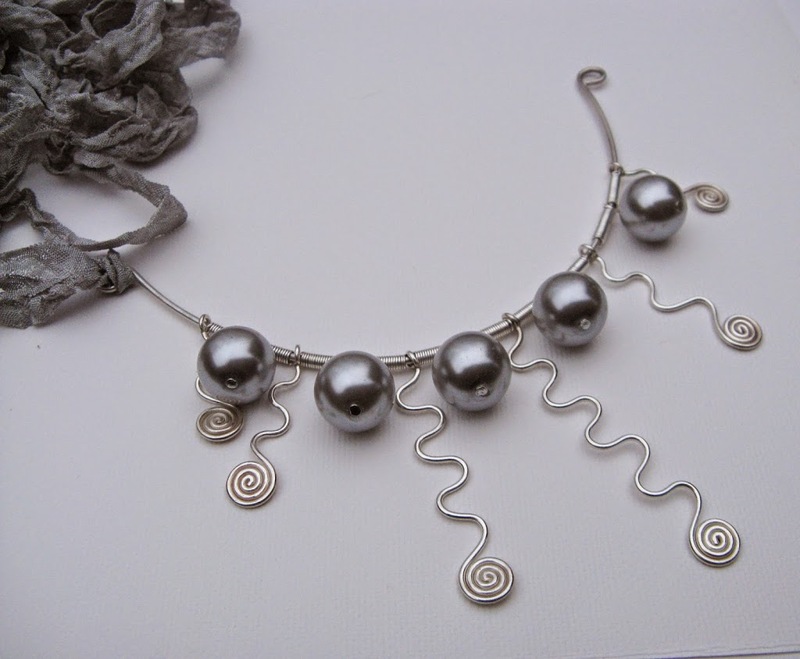 I love those squiggly swirls you created to complement the pearls. The necklace is sure to look amazing on and receive many compliments. I look forward to seeing how you finish it off. 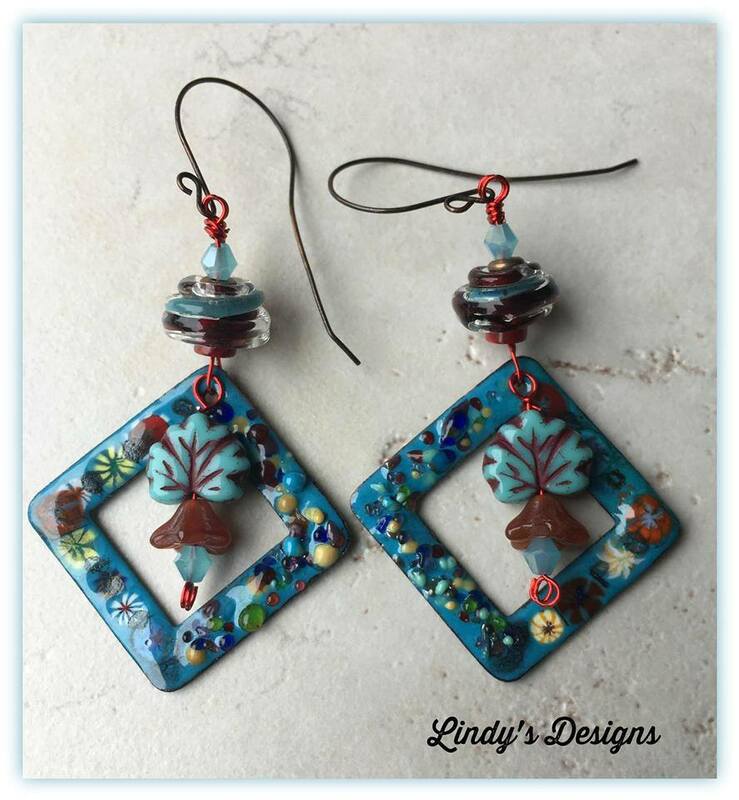 Linda ~ The funky vibe of the squiggles and the pearls on the wire is fantastic! You had a good vision for these beads. I think the black leather would tie it all together beautifully ~ cool and edgy. The grey ribbon adds a nice softness too ~ more romantic. I looks forward to seeing what you choose. It was a fun hop!